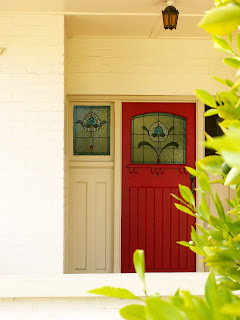 The Artist and I spent Australia Day at home, me weeding, him painting. We have only been living here for a few months and when we arrived, the huge ‘garden’ had been decimated and nuked by the owners who are obviously not the gardening type. At all. It was a sad state of affairs. So, since September we’ve been slowly letting the older plants find their way back (the wisteria is coming along particularly well) and we’ve added some of our own pots here and there. While weeding I found, much to my delight, that purslane is spreading across the pavers in the front garden. I’ve been reading all sorts of good things about this little weed and am pleased to say these plants of ours are crisp, lush and juicy. There are health claims made that purslane is a rare plant source of the rather elusive omega-3 fatty acids, as well as being endowed with other attributes (vitamins C and E and beta-carotene to name but a few), but I love that this is a weed and it tastes good. Lemony and crisp all at once. In the Middle East and Greece it is treated as a vegetable of note – here you’re just as likely to pull it up and heave it out. Now, I love something for free. And I mean actually free, not free as in ‘buy one get one free’ or ‘free gift with every purchase’ (an oxymoron if ever there was one – aren’t gifts always free? Regardless of purchase? Mmm...). What to do with such a bounty? I tossed a handful into a salad of cherry tomatoes with an olive oil-rich dressing. Quite nice and a good use for all the yellow pear-shaped fruit I cannot keep up with, but better still was the salad with boiled new potatoes. Now we’re getting somewhere! Firstly, make sure that it has not been doused with any sort of chemical – so no picking by the side of the road or in the park, okay? To prepare purslane, snip off lengths about the size of your hand. If the stems are thin and delicate, by all means use these too, but if yours is as mature as mine the stalks will no doubt be too tough, so just use the leaves you pull off. 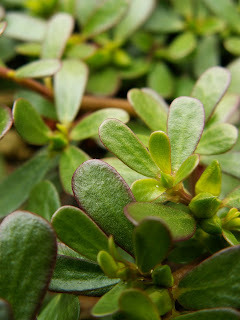 Beware - purslane waits for no one, so get on with your recipe before it goes slimy…now there’s a horrid thought! If you haven’t got purslane, watercress is a good substitute. Place the potatoes in a saucepan covered with cold water. Bring to the boil, then cook in simmering water until tender. Drain and set aside to cool. 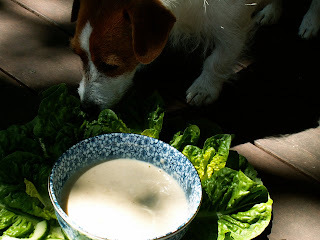 Gently, using a large spoon, mix the potatoes with the mayonnaise, purslane, celery and capers. Taste for seasoning (salt and pepper are necessary here, but the quantity is left entirely up to you) before squeezing over some lemon juice. Mix once more, even more gently this time, and serve showered with the sumac and pistachios. I am not a natural salad maker. Never have been. Don’t get me wrong, I love a salad, well-dressed, tossed at the last possible minute and arranged with love, and will happily eat a whole bowl completely on my own. It’s just that often a salad in itself doesn’t quite seem to be enough and I find myself opting to make something a little more complex, as though a salad just isn’t enough work. But something has changed. Maybe it’s the weather. Maybe it’s attempting to eat as many vegetables as possible every day. Whatever it is, salads are appearing on our table as complete meals on their own, much to my surprise and delight. I bought some beautiful organic blueberries from the market on Saturday morning and found a rather sad-looking bulb of fennel lurking about at the back of the fridge on our return. This salad (doesn't it look spunky?) was what we ate in the afternoon. 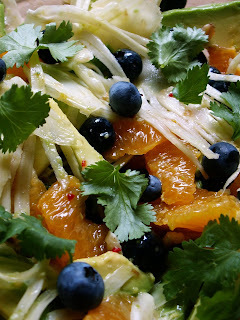 Look, this salad goes against one of my old principles – that fruit and vegetables should not play together – combining the incredibly unlikely combination of oranges, blueberries (rich in antioxidants) and wafer-thin slices of fennel (a source of gentle, crisp bitterness in our overly-sweet Western diet). What can I say? It’s luscious. It comes, with a little adaptation by me, from Nadine Abensur’s ‘Crank’s Bible’. And it looks so beautiful. Mix all of this together and set aside. Combine all of the ingredients in a shallow salad dish and toss very gently with the dressing (maybe not all of it, especially if your oranges were as juicy as mine) and serve immediately with extra coriander sprigs if you can be bothered. ...in which I finally work out how to put pictures up. Poppy likes a bit of tofu on a hot summer afternoon. The tomatoes have taken over the front yard. 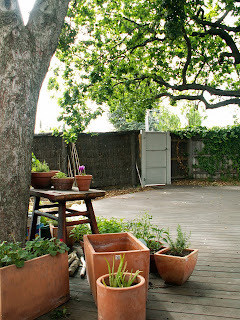 Their sprawling arms are spreading across the pavers, heavy with as yet unripe fruit. Lazy gardener that I am, I have neglected my trussing duties and now it is too late to halt their progress. Despite all of this they are producing masses of tomatoes - yellow pear-shaped ones, huge swollen ‘black’ ones and, finally, the bright red variety whose name I promptly forgot the moment it was in the ground. The only problem is birds. Our dog Poppy has not been performing her duties either – she normally relishes any chance to scatter birds and give them a good yelling at, but these birds are stealthy. They come when she is inside with us, keeping cool. But I can’t quite bring myself to net the plants up. I think that if the birds want to enjoy some of these beautiful fruits, then they must be good. Just so long as there are some left for us. He is working in New Zealand this week. I've found it difficult to bother cooking anything spectacular, opting for easy over time-consuming. The heat is getting to me this year like never before.